Just as you need to have the right conditions in place for plants to grow and blossom into flower, so an organisation needs to ensure the right conditions are in place for innovation to be seeded and successfully grow and deliver business benefit. We all know that for plants to bloom, we need the combination of a nutrient-rich soil, sunshine and water – and of course some ‘green fingers’. 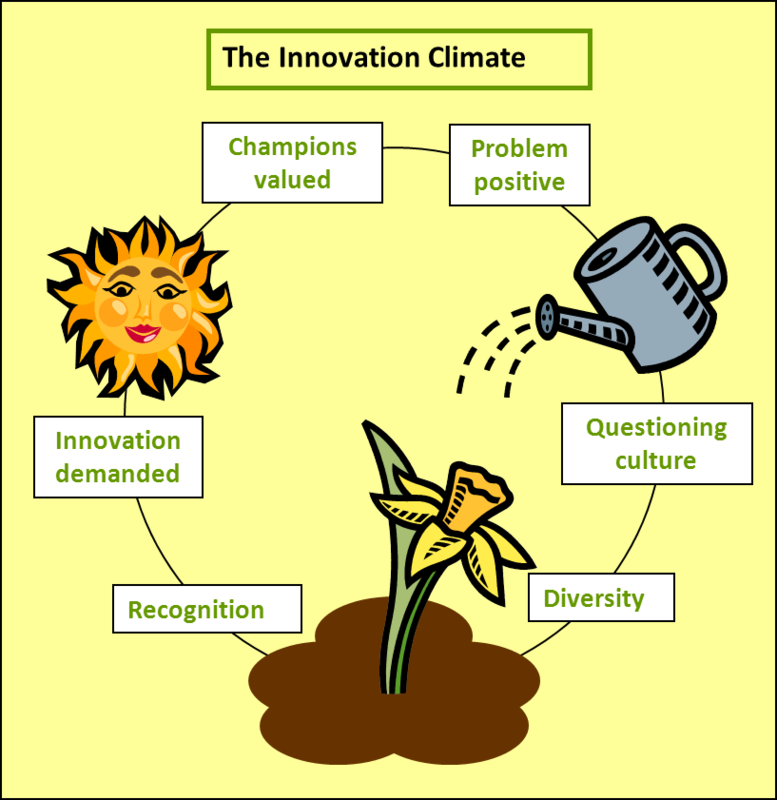 The principles are similar in creating the right climate for innovation to bloom within a business: you first need to understand the conditions under which innovation blossoms; then you need to create a ‘business climate’ under which these conditions are maintained. Thanks to academic research and business experience, we know what these conditions are and how to optimise them (see Figure 1). “A lot of companies have innovation departments, and this is always a sign that something is wrong when you have a VP of innovation or something. You know, put a for-sale sign on the door….. Everybody in our company is responsible to be innovative, whether they’re doing operational work or product work or customer service work.” Tim Cook, CEO Apple. “The creative process at Apple is one of constantly preparing someone – be it one’s boss, one’s boss’s boss, or oneself – for a presentation to Jobs. He’s a corporate dictator who makes every critical decision – and oodles of seemingly noncritical calls too, from the design of the shuttle buses that ferry employees to and from San Francisco to what food will be served in the cafeteria.” (Source: ‘How Apple works: Inside the world’s biggest startup’, Fortune, 23-5-2011). An innovative organisation is a curious organisation – curious about problems and about different ways of doing things. The culture needs to encourage this behaviour in its people. Being open to questioning and challenge from all levels within the organisation and from outside is a key attribute of an innovative organisation. Breakthrough innovation comes from the challenging of deep-rooted paradigms that exist within a business or market. “To support our focus on innovation, we operate a culture that is open to the challenging of norms,” says Sir David McMurtry, Chairman of Renishaw, a world-leader in the design and manufacture of measurement systems and a multiple award winner of Queens Awards for Export and Innovation. Achieving this culture requires humbleness rather than arrogance in a firm’s leaders and its employees. Humbleness? This is not a characteristic that is often demanded of managers and employees in a dynamic business. I’m not suggesting that personnel should be submissive and lacking in ‘go’. But I am saying that people need to recognise that they don’t know everything, that their firm’s current ways of doing things may not necessarily be the best and that they themselves can always improve. This is a mindset that allows individuals and the firm as a whole to be receptive to improvement. Being open to challenge and new ideas requires a level of personal confidence that is often missing in organisations. In an innovative firm, problems are seen as opportunities for improvement as they signal weaknesses in the current ways of working or product offering. Organisations that truly regard problems as an opportunity for learning (rather than an opportunity to blame) will foster a culture that is always seeking to learn and improve. In Continuous Improvement, problems are regarded as ‘gold’ for they offer clear improvement opportunities. A ‘Problem Positive’ organisation will have a robust approach to problem-solving in place, rather than a fire-fighting blame culture. “Fail often to succeed sooner.” is a key maxim of Tom Kelley, the General Manager of IDEO, renowned for its innovative design capabilities and an appropriate one for any company seeking to be innovative. The enemy of innovation is corporate group think. Alternative viewpoints and experience are critical to enabling a climate for innovation. This is achieved by recruiting and retaining a mix of people with different industry backgrounds, ages, personalities and nationality. Colgate is a good example: “As a company, we celebrate differences, promote an inclusive environment, and value the contributions of all Colgate people…We look to promote an inclusive environment and support the diversity of thinking that results from the differences in experiences, knowledge and background of all Colgate people. Diversity of thinking will help us continue to encourage the creativity and innovation necessary for our Company to maintain a competitive advantage in the global marketplace.” (Source colgate.com) If you are looking for fresh ideas, you need to have a diversity of thinking within your business. If your workforce is too similar, you will likely get ‘groupthink’ and a lack of truly new ideas. All organisations have their stories and their heroes. An innovative organisation will have stories about major change and their champions – not all of which was necessarily successful. But the general tenor of such stories will be invariably positive rather than critical. 3M have stories about mavericks that pushed through new ideas despite initial opposition (e.g. Post-It Notes). 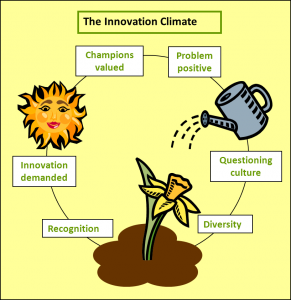 Those people who champion innovation, whether they are instigators, active participants or arms-length supporters will be valued within an innovative organisation. And since radical new ideas typically come from the ‘mavericks’ within an organisation – the sort of people who can be poor team workers and difficult to manage – an innovative organisation works to keep its mavericks. Human beings crave approval. This need changes little from when a person was a child to when they become an adult. In a business, salary/bonus is one form of approval – but it is by no means the only one or indeed the most effective one. Approval and recognition from one’s peers is often of higher value to an individual. Providing formal awards and recognition for innovators within the organisation, including financial, non-financial and sabbaticals is an effective way of encouraging innovation activities and rewarding innovation ‘champions’. It also clearly signals the company’s intent to employees. In some organisations, innovation is not welcome as it is seen as disruptive or ‘taking people away from daily business’. In many organisation it is welcomed if it can be proven to be beneficial and affordable, but in a few organisations, innovation is actively demanded – and not just from its managers but from all its employees. Stories are told about past innovators. These are the people that have high recognition and status within the organisation. This is supported by the use of innovation metrics and innovation criteria in employees’ yearly targets and appraisal reviews. In such an environment, employees will continually keep their eyes open for innovation opportunities as they know that this is valued within the organization and it is a key performance measurement. Assess the health of innovation in your organisation, by reviewing key practices and performance and getting the views of your employees, managers and partners. This will identify key strengths (to be enhanced) and weaknesses (to be addressed) in your current innovation system, including your climate. We use our proven Foundations for Innovation (F4i) assessment solution, developed with our academic partners. We have used this approach with businesses in the industrial, legal and insurance sectors in the UK, Europe, USA and China. Train your management team in the key mechanics of an innovation system, their key role and how to establish a supportive climate. Codexx uses a mix of training and interactive ‘Catalyst’ workshops to do this. Put in place some innovation metrics and rewards to stimulate innovation projects within your organisation. This approach is based on the reality that measures and rewards drive management and employee behaviours. One way of doing this is to establish an innovation competition, to help meet key business goals. Another is to make evidence of personal innovation activities an element of performance appraisal (or promotion). Start a project that is innovative in its goals (e.g. step-change improvement or a new product or service area) or in its approach (e.g. cross-functional teaming, collaboration with external partners or clients) and staff it with personnel who can subsequently become broader advocates for innovation in the organisation. Codexx uses its ‘Smarter Working’ re-engineering approach to start such internal re-engineering teams. Use benchmarking and practice sharing to ‘open the eyes’ of your managers and employees to better practices in other organisations and so stimulate new thinking. For more information on this, go here. Each of these approaches has merits and any one is a good start in improving your existing innovation climate. 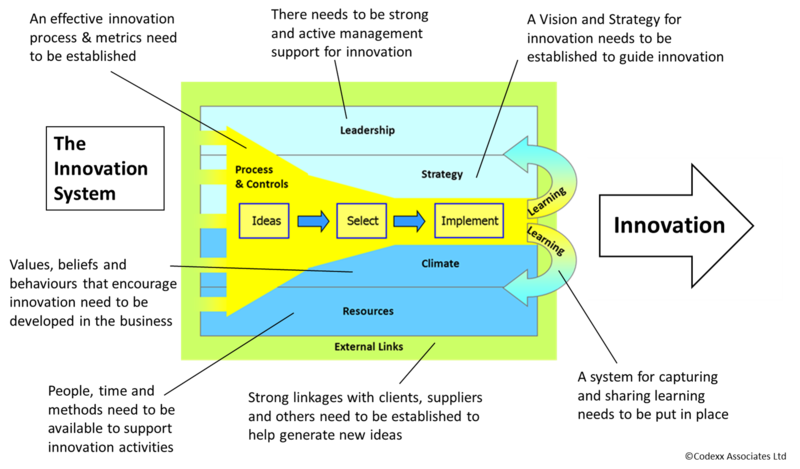 However, to establish an effective climate for innovation, it has to be built as part of a wider holistic innovation system, encompassing other key elements such as Leadership, Strategy, Process & Controls. *This article draws upon materials in the book ‘Innovating professional services – transforming value and efficiency’ by Alastair Ross, Director of Codexx, published on the 8th May 2015 by Gower. For more information and online discount click here. Innovation in professional services – why, what and how? So this is a key business sector and also one that is facing major challenges to both its business model and its operating methods from a combination of globalisation, regulatory changes, client demands and the impact of the internet and Information Technology. These challenges are driving progressive firms to respond through innovation in how they operate and the value they provide to their clients. Many professional service firms would like to improve their innovation capability, but often do not know where to start or how to establish and sustain a culture for innovation. Some sectors such as law have enjoyed long term stability and have not needed to significantly innovate, but this is changing due to the new business pressures. This short article identifies some of the key approaches required for effective innovation in professional services and some of the common challenges encountered. It is based on our consulting experience with professional service firms over the past 10 years, together with insight from our academic partners. Much time and effort can be spent arguing about what is and is not innovation. Whilst there is no ‘correct’ answer, it is key that there is a common definition and understanding across an organisation. In our experience the most effective definition is that innovation is anything that is ‘new to you’. This means that innovation includes incremental improvement as well as radical innovation. It also includes methods already in use elsewhere, (even within other parts of your business) that are adopted in your business. Whilst radical innovation gets the headlines, it is the much less glamorous regular small improvements that make up 95% of innovation ideas and can be massively powerful (witness Toyota’s rise to be the global automotive leader based on 50 years of Lean (i.e. incremental) improvement). This inclusive definition of innovation is the most useful to business management who wish to establish a culture and system of innovation. Recognising the power of a high number of small ideas is at least as important as seeking the very few ‘game changing’ innovations. At its simplest, innovation is about generating ideas and converting the best ideas to value for the business. We can consider a farming analogy for innovation (Figure 1), where an effective system and supportive environment are required to grow and harvest the best ideas. It is important to recognise that creativity alone is not innovation. Creative ideas that are not implemented do not result in innovation. A common area for business innovation is innovation in business processes which govern the ways of working. This has much potential in professional service firms where process definition and management can be lacking. Process innovation is an excellent way of engaging employees to come up with ideas for incremental improvements in their working methods. Bigger step change innovation can be driven through a re-engineering approach. Process innovation can involve waste reduction, reorganisation and ‘right-skilling’ of the personnel performing the process and the application of IT. The example in the model is of the insurance company QBE who applied 6-sigma improvement methodologies to process improvements in their business. Innovation can also be applied in the services provided to clients, either to improve existing services or create new ones. In the model, the example given is of the law firm Mills & Reeve who developed an iPhone App for their Divorce.co.uk offering. We have worked extensively with major UK law firms to help them re-engineer services such as Due Diligence, Employment Tribunals and Inquests to increase value and service to clients and reduce cost of delivery. 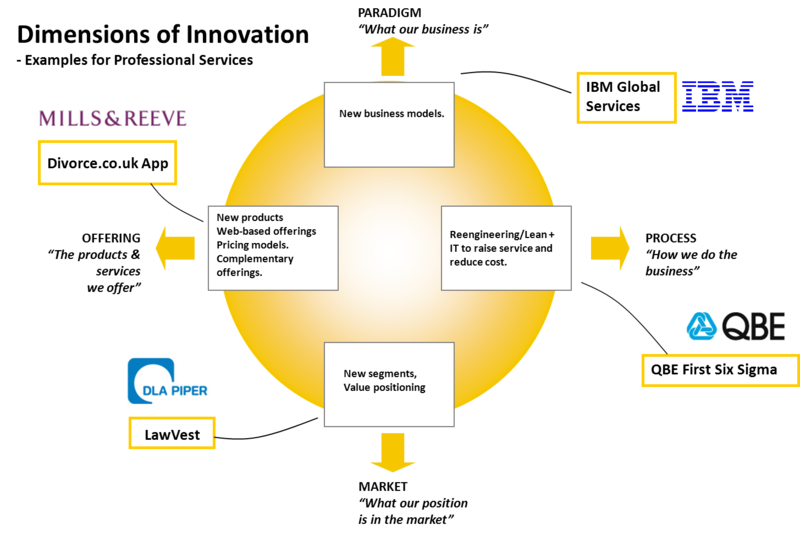 Another way of innovating can be in the repositioning of the firm’s value proposition in the marketplace. To take advantage of deregulation in the UK legal market, the major UK law firm DLA Piper jointly set up a new vehicle, ‘LawVest’ to enable investments in new fixed price services for mid-sized businesses. The last innovation dimension is the hardest to exploit as it is quite simply the reinvention of the firm’s business model. The example given is that of IBM, who from the early 1990s, over a decade, transformed their business away from one based primarily on hardware to one based on software and services. The internet provides a powerful vehicle for firms seeking to develop new business models, enabling on-line services, with global reach and at substantially lower cost than personal services. Examples of new internet-enabled professional service businesses include crunch.com for online accountancy and freelancer.com for software and design solutions. 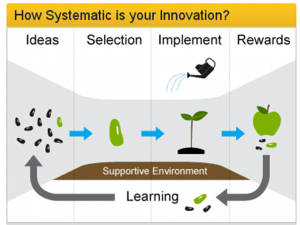 The ‘Innovation System’ model is an effective way for a business to think about and develop their innovation system. We have helped a number of businesses improve their innovation system by using our ‘Foundations for Innovation’ (F4i) solution to assess their current innovation capabilities against 60 best practices underlying the innovation system model. Many firms effectively discourage innovation through a combination of leadership behaviours, organisational ‘norms’ (e.g. “more of the same has worked well for us for 20 years so why change?”) and resistance to change dominating the firm’s culture. A key challenge for professional service firms is that fee earners typically only value time that is chargeable, and therefore are disinclined to invest time in other activities (e.g. innovation) which will not be valued in their performance appraisal or bonus. The key resource required for innovation in a professional service firm is time – particularly the time of fee earners and key support personnel. Time is needed to reflect on the business, to gain insight from clients, to analyse existing methods and brainstorm new ones, to develop, implement and deploy new solutions. Few professional service firms have established dedicated ‘innovation teams’ armed with methods and budget who can be used to support innovation projects. Once an idea has traction, the other resource barrier that typically emerges is IT resourcing. A core foundation for effective innovation is a robust process that links ideas with delivered value (e.g. a new or improved product/service, a new way of working or a new pricing model). This process must guide idea development, selection and investment using appropriate criteria, and monitor and support development and implementation. Whilst an innovation/new product development process is common in the industrial sector, it is less so in professional services. Its absence means that innovation ideas from employees can struggle to be heard and in comparison poor quality ideas can be pushed through if championed by a Partner or senior manager. There is a distinct difference between creativity and innovation. Creativity may be required at the start of the innovation process (even if it is simply to borrow an idea from another sector), but it has no value without execution. Firms can be guilty of under-resourcing implementation – for new products this can include insufficient resourcing for marketing and selling the new offering. The ‘long slog’ of implementation can be less attractive for employees and managers than attending a few brainstorming workshops to generate new ideas…. Implementation needs to be a recognised critical part of a firm’s innovation process and resourced accordingly. A key innovation opportunity for professional service firms is in dramatically improving their cost performance by streamlining services and internal processes and ‘right-skilling’ work – with significant amounts of repetitive work being moved to lower skilled personnel, automated or outsourced. The use of ‘Standard Operating Procedures’ together with IT-enabled workflow means that work can be performed at a similar level of quality as before but at much lower cost. This frees up experienced personnel to take on higher value work and also to have time to spend on innovation and business development. However, the flip side of this benefit is that these personnel will in the short term lose a significant amount of their work. This can create concerns about their long-term future and short-term compensation. Long-serving employees may also consider that the ‘professionalism’ of their firm is threatened by the use of semi-skilled employees now performing their work. But as I have said a number of times to legal partners – if they decide to buy a Porsche, they will expect high quality and high performance. But they will not expect that it will be built by the CEO of Porsche! They accept that it will be built by a semi-skilled worker on a production line, but following processes and procedures codified from the experience of the firm’s engineers…. This lesson equally applies to professional service firms. A key paradigm change for professionals is in separating their role into the two elements of design and delivery. A professional may bring more value to their firm by using their time to codify their expertise and supporting the design of new working methods) to enable it to be delivered by others or via an automated system) rather than delivering it themselves. Developing an effective capability for innovation is important in professional service firms as they seek to retain their competitiveness in an increasingly challenging global marketplace. Firms can learn from other sectors, but will need to ‘tune’ established methods for the services world. Assessment of firms’ innovation health against our F4i innovation best practice model and developing an improvement strategy. Training – of managers and employees in innovation approaches and methods. 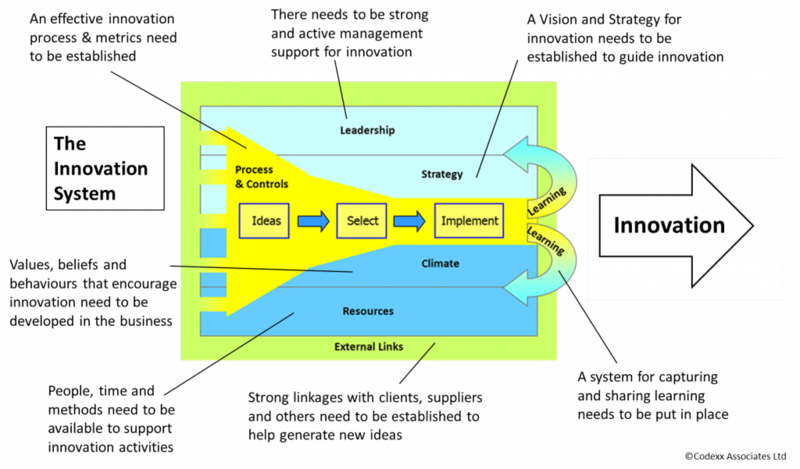 Establishing key elements of an innovation system (such as a strategy, processes, resourcing). Developing department/sector strategies using Strategic Road-Mapping to align innovation activities with market strategies. Running user/customer/client collaborative studies to determine opportunities for value innovation. Re-engineering existing services (and internal support processes) to improve efficiency and value. Supporting the design and development of new service offerings. We have seen that such approaches can yield major benefits for firms both in terms of increasing service value, reducing cost and giving the organisation increased competencies for subsequent innovation. The reality is that for many (most?) professional service firms, establishing effective innovation will be challenging, yet rewarding and ultimately necessary for growth in the new business environment. For more information contact Codexx. The term ‘benchmarking’ originally emanated from the practices of cobblers, measuring people’s feet on a bench to make a pattern for a shoe. It was appropriated by business in the 1980s when progressive companies began to formally ‘benchmark’ themselves against each other. Its purpose was to drive business improvement based on identification of superior practices in other organisations. Xerox was the first major business to popularise it and since then it has become a core tool in the business improvement toolkit. Whilst benchmarking can be a very effective tool in catalysing and focusing improvement, it can also be easy to misuse, with the result that the not insignificant resources required can fail to yield usable improvements. Codexx has gained significant experience in benchmarking programmes since it was established in 2002 and our consultants have additional benchmarking experience gained from their work with previous employers such as IBM, Philips and Cranfield School of Management. Our experience includes the benchmarking of manufacturing practices and performance, supply chain management, R&D, general business innovation and law firm innovation. This experience has given us a good feel for both the strengths and weaknesses of benchmarking as a whole. In this short article we want to share some of the key lessons we have learned and our recommendations on how to best to use benchmarking methods in your own improvement programmes. In practice, many benchmarking assessments will be a hybrid of two or more types to suit specific requirements. A key success factor in benchmarking is not to lose sight of the goal. In benchmarking the goal is to be able to use the assessment findings in a practical way to catalyse, focus and effectively execute changes in business practices which will yield performance improvement. The benchmarking findings (the ‘score’) should never be seen as an end in itself – although, in our experience, that can all too easily happen as managers use the findings simply to validate a past or planned action, rather than to use it to drive improvement. 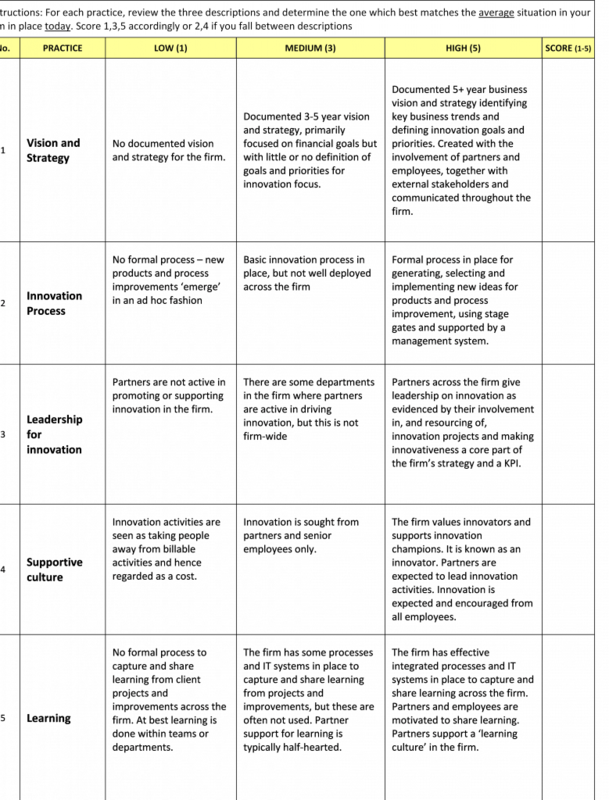 This type of benchmarking can be considered as the ‘classic’ benchmarking with its focus on comparing the selected business against a defined set of performance metrics and comparing the results with a database of other businesses on an anonymous basis. Sometimes benchmarking exercises make the mistake of focusing solely on performance metrics, and only part of the story is revealed. By also comparing business practices in an objective way (e.g. through the use of maturity grids) a more valuable assessment can be performed helping to answer the ‘why?’ as well as the ‘what?’ of the scoring. For example, if a manufacturing company is shown to have high inventories compared to the average in its sector, weak practice scoring in the use of lean practices and the use of large production batches would explain this poor performance and give management a list of areas for improvement. A good example of this type of benchmarking is the Probe manufacturing benchmarking tool. This was developed by IBM Consulting and London Business School in 1992 as an objective way of assessing a manufacturing operation against world class standards. It was based on a model of World Class Manufacturing that drew heavily on lean thinking. The benchmarking tool provided numerical scoring based on practice maturity and measurable performance achievements, and grew to a database of over 2000 manufacturing sites. Codexx has been a licensed user of the Probe manufacturing benchmarking tool since 2002 and we have used Probe for multi-factory benchmarking on a regular basis. An excellent example of a company that has successfully applied best practices benchmarking and improvement is Grundfos, the leading global pump manufacturer with factories in Europe, America and Asia and headquartered in Denmark. Grundfos started using best practice benchmarking using PROBE in 1996 to assess the practices and performance in its factories. This identified gaps with best practices including the need to utilise Lean manufacturing approaches. Grundfos commenced implementation of lean manufacturing techniques across their factories from 1997 and continued regular PROBE benchmarking supported by Codexx. In parallel it used EFQM to drive overall Business Excellence. Grundfos Denmark won the EFQM award in 2006. In the PROBE benchmarking assessment in 2008, their Danish factories scored at a world class practice level. The result has been clear improvement in key performance indicators such as on-time delivery, inventory turns and quality. Uses a structured approach and provides quantified comparisons with other organisations on an anonymous basis. The large database of businesses that have been benchmarked against the defined practices and performance provides an authoritative comparison. This can be a cost-effective approach – the license or consulting fee required will be less than the total cost of a ‘do it yourself’ approach. The benchmarking exercise can be performed without visiting other companies so does not require much time. The underlying model that the benchmark is based on is key to its relevance and its makeup should be clear to participants. It is all too easy for this to be complex and opaque and therefore unclear as to the validity and relevance of the final scoring. Performance benchmarking alone does not provide easily actionable improvements. An effective Quantitative Benchmarking tool will cover both practice and performance. The scope of the benchmark and the practice and performance areas covered are pre-defined by the benchmarking model and there is little or no room for flexibility. This benchmarking approach uses a defined framework of key practices with levels of maturity, i.e. from weak to strong practices. It is used when there is an absence of a large database of companies which have been assessed against these practices, so quantitative benchmarking is not feasible. Typically this would be because the nature or scope of the practice area is not wide enough to have merited academic or consulting study and the development of a benchmarking programme. This approach suits niche assessments of specialist areas, where a structured comparison against best practices is required. The lack of a database of comparative data means that the process must involve a number of like-minded organisations, all seeking to learn how to improve performance in the area involved. 1. To help ‘open the eyes’ of the maintenance managers to better practices in other maintenance organisations – and thus encourage change. 2. To provide a quantifiable comparison of practices and some key performance metrics with organisations with measurably better maintenance operations to provide a set of improvement targets. 3. To provide examples of improved practices which could be transferable to their business. 4. To learn about each company’s ‘journey’ to their current maintenance practices and benefit from their learning. We initially looked to use a commercially available benchmarking tool for this work, but we found no tool that was broad enough to meet the client needs (most were focused on specific aspects of maintenance such as cost). We therefore developed an assessment framework built around a skeleton provided by the ISO 9001 8 principles of quality management. On this skeleton we added maintenance-specific practices and performances and developed this assessment model collaboratively with the client’s re-engineering team of maintenance managers – with whom we were already working. This approach was used to benchmark five other European companies, using 1 day visits – attended by the majority of the maintenance managers – supported by prior data sharing and preparation. Each participating firm was provided with an assessment report and overall scoring – it was important to ensure that each participating company gained value from the exercise. The assessment approach provided much insight to the maintenance managers and was used to develop improvement projects as part of the re-engineering programme. The scoring also provided a measurable set of practice and performance targets that were used over a three year period to measure re-engineering progress, with 6-12 month self-assessments against the framework (more information). 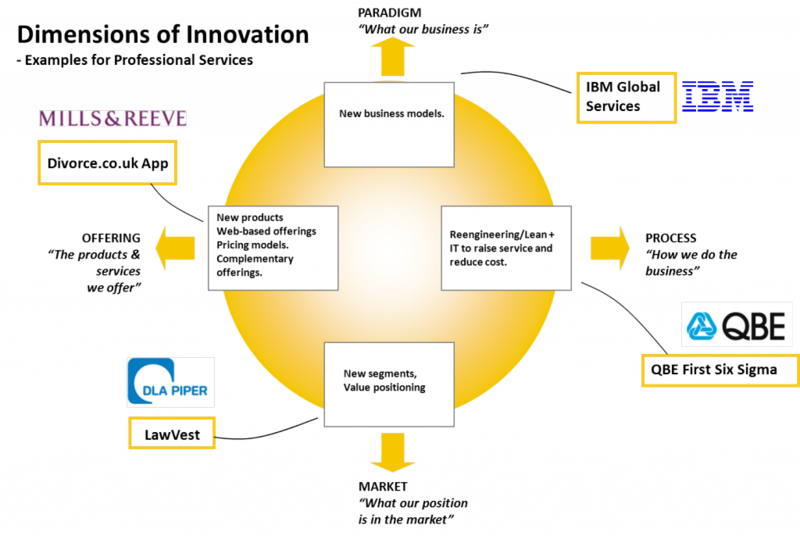 Figure 2: Extract from F4i showing questions on innovation practice maturity. Another example of this approach is in the development of the Foundations for Innovation (F4i) assessment tool by Codexx in 2006. This was born our of our recognition of a lack of a cohesive tool for assessing an organisation’s innovation ‘health’ in a cohesive and objective way. F4i was developed with the support of Imperial College Business School to bring academic rigour to the development of the assessment tool. 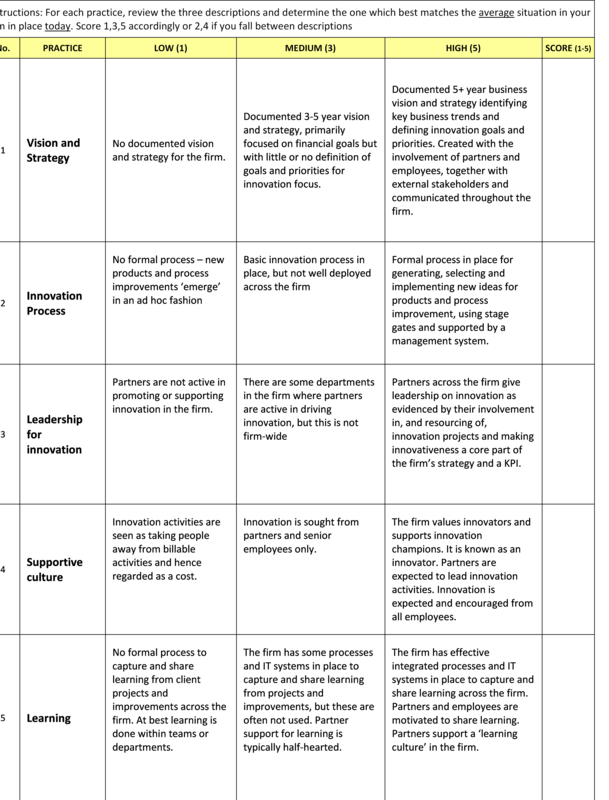 Based on an academically validated model of innovation, it used 60 key innovation practices and performance metrics to enable a quantitative assessment of innovation in a business (see figures 2 & 3). We have used F4i in innovation assessments of industrial and service organisations across Europe, USA and China. F4i does not have a large database of companies – we focus primarily on how participating organisations score against the defined practices and more importantly in the underlying reasons for weak practices. We took a similar approach in the development of an innovation assessment for the legal sector, building on our experience of working with major UK law firms in innovation since 2005. We used this to perform a study of innovation in 35 UK and German law firms, together with the business schools of Exeter and Leipzig universities (more information). The assessment framework can be tailored precisely to the specific needs of the organisation (or group of companies) involved. The assessment approach can again be tailored as required. Learning is gained from the visits to other organisations. It is typically a more expensive approach to benchmarking than Type 1 as all the costs of development usually have to be borne by the lead partner(s). There needs to be mutual value in the assessment for each participant and the lead organisation needs to recruit the involvement of others and typically cover the costs of the framework, travel to the other companies and in the scoring and reporting. 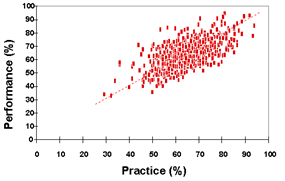 The limited number of participants results in a limited data set which restricts the ability to identify and validate relationships between practice and performance. Findings are thus more indicative than anything. A custom assessment framework needs to be developed for the benchmarking exercise by one of the parties involved in the assessment or by a supporting consultant. 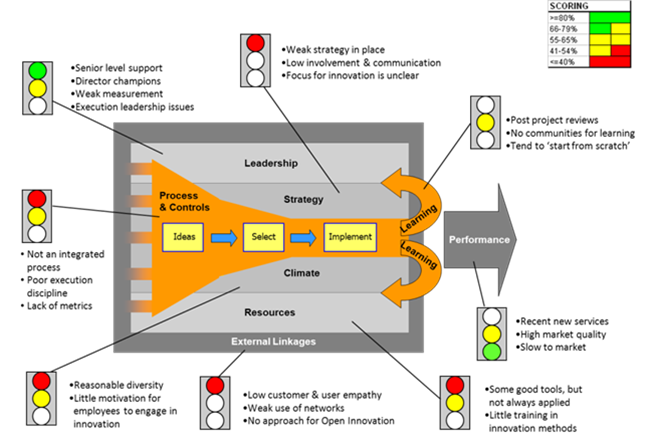 Figure 3: Example of ‘traffic light’ scoring against overall F4i innovation model. This final type of ‘benchmarking’ is comparatively unstructured and primarily produces a qualitative assessment. One could argue that this is what normally happens in ad hoc and unstructured visits to other companies. Such informal benchmarking is sometimes referred to as ‘industrial tourism’ where the lack of any objective or structure to the visit results in limited value and few actionable outcomes. We are not advocating this approach. Structured qualitative practice assessment does have objectives and an assessment framework but it is deliberately loose. Codexx have facilitated a number of such assessments in a practice sharing programme on manufacturing technology areas, between a major Scandinavian and German manufacturers where there was mutual interest in a specific area of production technology development and the companies did not compete directly in their customer markets but were mutual users of each other’s products. Our approach to these assessments was to develop an overall practice framework (again based around the ISO’s 8 principles of quality management) and develop specific practices around this framework in collaboration with the two companies. An assessment visit programme was arranged and the framework used to scope and focus discussions. Key findings from the assessment were documented for each company. Suitable for use in highly specific business areas where an existing benchmarking tool is unlikely to be available. The flexible framework enables practice sharing visits and discussions to accommodate discussion and evaluation of thinking, methods and experience which emerge as of value to participants, and would not easily be accommodated in a tight prescriptive assessment format. Basically ‘best practices’ in this area are not well defined or understood and so the assessment approach needs to accommodate emergent practices that have proved to be of value to at least one of the participating organisations. Requires participants to each have areas of practice which are perceived to be progressive by other partners, so each participant can learn from the assessment – not just teach the other participants. This means that pre-work is typically required to engage participants and establish the potential for a mutually beneficial practice sharing arrangement. There is a danger that the assessment will be so flexible and loose that it becomes difficult to make objective comparisons to enable effective learning for participants. Again one party needs to take the lead in such a practice sharing programme. Benchmarking is a proven way to compare an organisation’s effectiveness with others and do this in a way that provides objective findings that can be used to catalyse business improvement. However, sometimes traditional benchmarking can be expensive, too ‘one size fits all’ and its scoring opaque to participants. Less formal methods, based around ‘practice sharing’ can be effective at achieving the required objectives of catalysing improvement – without the ‘heaviness’ of typical benchmarking – and enabling a more personalised fit to the requirements of the participants. Overall, it is key that, whatever benchmarking approach is used, participants do not lose sight of the ultimate aims of the activity: to catalyse and focus improvement activities. You are currently browsing the Codexx blog archives for May, 2015.